There’s something both endearing and profoundly disturbing to me about this particular stage of life. 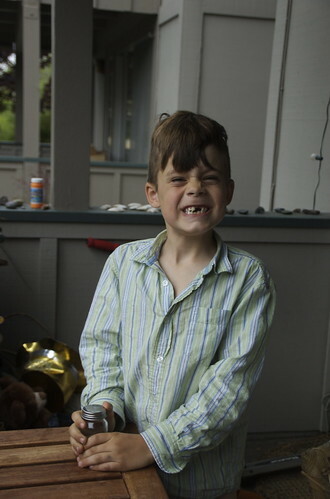 My boy had been wiggling that top tooth for at least four months before it finally came out of it’s own accord yesterday morning. He was so proud to display his new smile, and quick to run & get his jar where he keeps his collection of teeth (now three). With all the talk of moving to NY as soon as Mom or Dad finds an appropriate job (which we haven’t done yet), not knowing where he’ll attend the second grade, and the end of the school year fast approaching, he’s been a bundle of nerves and energy lately — more-so than usual. I wish I could hold time still for him, if even just for a little while. How cute! I love that he has a jar for his collection! I think that’s a hoot! !